Mohamed Mounir, the Egyptian superstar dubbed “the King” by his loyal fans, will give a concert at Family Park on the Cairo-Suez highway on 1 March to celebrate the release of his new album Watan (“Homeland”). Mounir has so far released four singles from the album via a mobile operator, and the rest of the album is expected to be launched soon. Watan is the first album the Nubian singer has released since Ahl El-Arab Wel-Tarab in 2012. He has released a few singles in the six years since that album, however, including Ana Mennek Etaalemt (“I Learned from You”) and El-Qahera (“Cairo”), the latter of which featured megastar Amr Diab. He has also starred in TV series like El-Moghanny (“The Singer”) and appeared in a few advertising campaigns. Early this year, the 64-year-old star was hospitalised for several days with unspecified health problems. 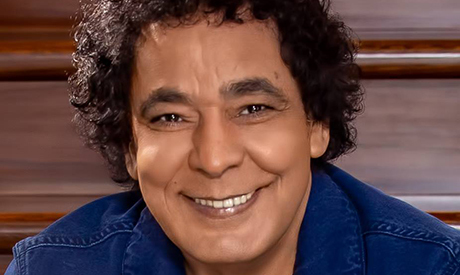 Mounir began his music career in the 70s and quickly gained an international reputation, building his fame by collaborating with famous poets and lyricists like Salah Jahin, Abdel-Rahman El-Abnoudy, Fouad Hadda, Ahmed Fouad Negm, Sayed Hegab and Abdel-Rehim Mansour. In addition to reviving many Nubian folk tunes, Mounir has worked with other big name musicians like Yehia Khalil, Fathy Salama, Hani Shenouda, Ahmed Mounib, Aziz El-Nasser and Wagih Aziz in a variety of genres. He has also appeared in many films, including director Youssef Chahine's Al-Maseer (“Destiny”), which competed at the 1997 Cannes Film Festival.